I should probably be working on college applications instead of writing a blog post about gingersnaps, but sometimes my priorities are less mature than they should be. 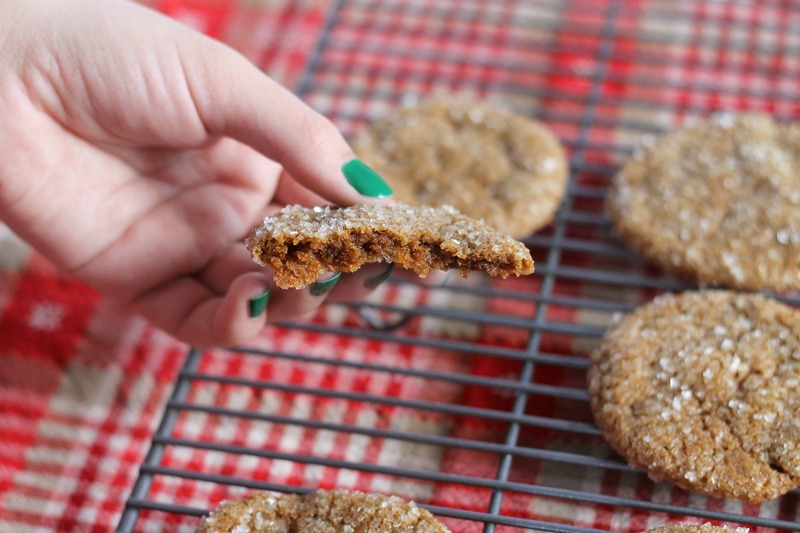 I won’t be too hard on myself about it, because these gingersnaps are seriously amazing! Plus, taking breaks participating in hobbies like baking/blogging helps give me the mental stamina I need to work on applications (or, you know, do other stuff like enjoying life!). 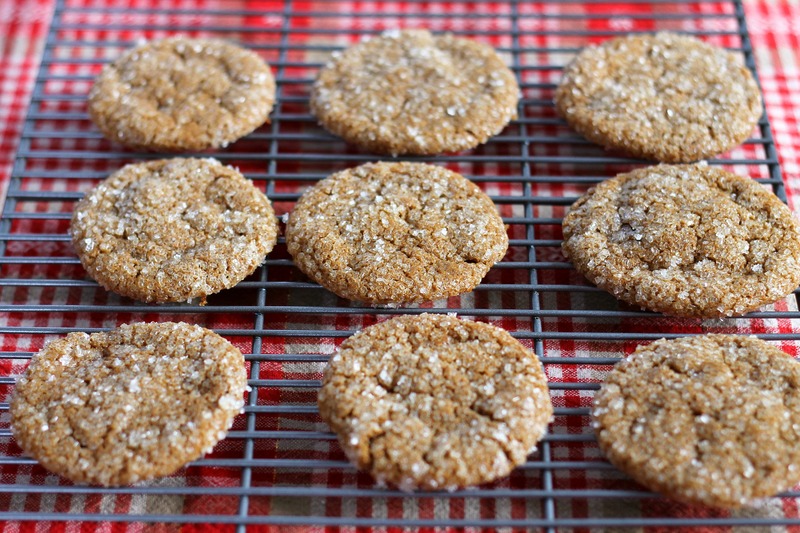 These gingersnaps easily made the “best-cookies-I’ve-made” honor roll, a great honor indeed. What makes these so special? Well, for one, they have the perfect cookie texture. The edges are crispy, the center is chewy, and the sparkling sugar adds a nice crunch. They also are perfect on flavor. 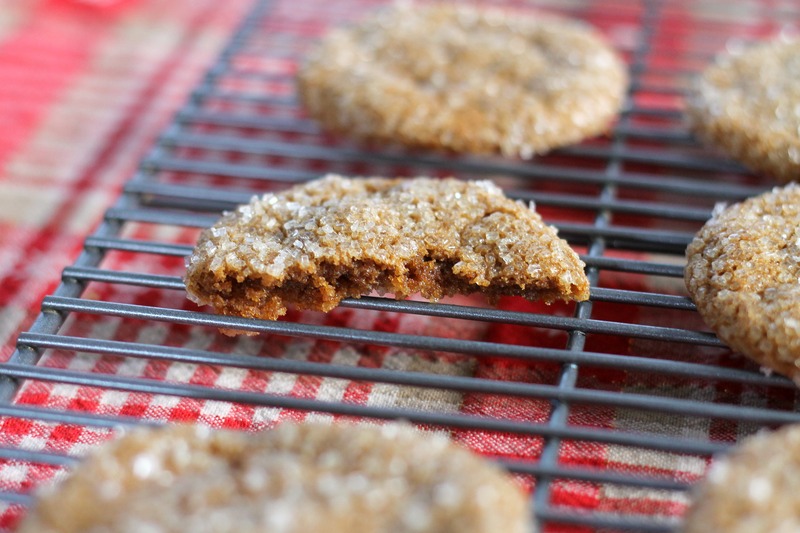 They have both molasses and brown sugar in them, plus the right amount of spices (last year we made gingersnaps with cracked black pepper in them-yuck. They had a weird spicy aftertaste). They also could not be simpler-you don’t even have to soften butter! Yes, these are the ideal Christmas cookies, and we cannot wait to make them again. Preheat oven to 325˚ F. Line baking sheets with parchment paper. In a medium bowl, whisk together the flour, baking soda, ginger, cinnamon, cloves and salt. In the bowl of an electric mixer, mix the oil, sugar, molasses and the whole egg until combined. With the mixer on low speed, mix in the dry ingredients until just incorporated. Put the sparkling sugar into a small dish. Shape small portions of the dough into 1-inch balls. Dip each dough ball in the egg white, remove and let the excess drip off. Roll the ball of dough in the sugar so that it is covered evenly. Repeat with the the rest of the dough balls. Place the coated balls on the prepared baking sheets about 2 to 3 inches apart. Bake, rotating the sheets halfway through baking, just until the tops of the cookies are set and beginning to crack, about 15-17 minutes (you can bake for slightly less time if you prefer a softer cookie). Let cool on the baking sheets a few minutes, then transfer to a wire rack to cool completely. Repeat with the remaining dough balls. Store in an airtight container. Enjoy!